Sleep training gets a bad rap. You don’t have to talk to too many moms or look on the internet for too long to get this message. 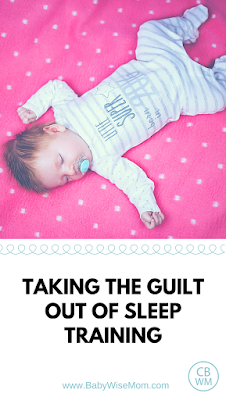 If you want your child to sleep well (especially for reasons that don’t involve your child’s welfare), people start to point fingers and call names. Maybe you don’t even need someone to tell you this before the guilt sets in. As parents, we give physically, mentally, emotionally and spiritually to our children all day, every day. We sacrifice like crazy. But what about us? What about our marriage? What about our family as a whole? Can nurturing ever be taken to the extreme? I think it can. There is a balance in all things. And we have our own personal limits to consider. There is a time when we turn from a great mommy to a mommy martyr. And it seems the subject of sleep is often one of these times. We need sleep to survive and most of us need a fair amount of it to take us from a mindless zombie to a functioning human. We shouldn’t feel guilty because we want some of it. We need it just like our children need it. It isn’t a desire, it is a need. Sleep is food for the brain and body. Inadequate sleep has many costs to us, our family and others. If you aren’t getting enough sleep you’re more vulnerable to depression, your marriage can suffer, your temper and emotional stability suffers, your health suffers and your children suffer. “A sleep-deprived family is an unhappy, unhealthy one.” (Bedtiming 4) For more on this see adults and sleep and children and sleep. We need to balance our needs with the needs of our family. We are no use to anyone when we are too tired to think or control our emotions or function in any ability beyond eat, step, sit. If you don’t nurture yourself, you won’t have any energy left to nurture your family. A baby’s sleep must work for the entire family. Everyone’s needs should be considered. You are a family, after all. Maybe this will mean you will continue doing what you are doing. Everything is peachy. Maybe this will mean your sleep training will only involve the encouragement of good sleep habits. Maybe this will mean you will do some kind of further sleep training (my thoughts on some of that). Personal capabilities and limits vary just as situations vary. We need to do what is best for us, our baby and our family. So drop the guilt and get some sleep! I loved this post!! I'm so sick of all my AP friends acting like they are so superior b/c they never sleep and feed their children every 2.4 seconds. I like to sleep. I NEED to sleep. Our reflux/MSPI baby just started sleeping through the night (14 weeks) and we are like this new happy healthy family all the sudden! I have four children and have done various methods of sleep training, Babywise style parenting to attachment parenting methods. I feel I can speak from experience and knowledge about this subject. If sleep training really means letting your baby cry for any length of time it is unhealthy for your baby. This is a fact. Also, please be clear that sleeping through the night is a five hour stretch. So if sleep training is done with those two very important things in mind (no harmful CIO, and 5hour stretch) then by all means do some sleep training. Please do not try sleep training with very young infants. I think in the throws of sleep deprivation and I have been there! sleep training can be a lifeboat for some as a tool to help get you through it. I think some good questions to ask yourself are – what kind of sleeper am I? Do I easily fall asleep or do I use some type of routine to help? Baby will benefit from those same routines. Last and maybe most important how do you feel when you are training your child? If you feel great and baby is doing well go with it. If you feel awful and baby is upset listen to your intuition – it is a powerful tool for mothering. You can't sleep train a newborn because children are not dogs to be trained. That's why. Sarah-I had the same concern when my third was born because she would be sharing a room with her older sister. What turned out to work for us was baby napping in our room and sleeping at night in the dining room. I too wanted to avoid moving the bed but I simply could not sleep with all the little newborn noises. The BEST thing we got was a bassinet on wheels as the pack and play was too hard to move from room to room. The different sleeping locations did not seem to affect her because she was always in the same bassinet for sleeping. When I did transition her to her crib in the shared bedroom I was surprised how much my six year old slept through! Best of wishes with your new addition! I agree! Sleep is so important. In my family, my husbandand I, and my babies have all slept best together in a family bed. It is the only way for us and no sleep training needed! Jill, I obviously would disagree with your statement of CIO being unhealthy. My three children have done it and are now 3, 5, and 6 (almost 7) and happy, healthy, intelligent, thriving children. Their various teachers and coaches love them. They also happen to be amazing sleepers. 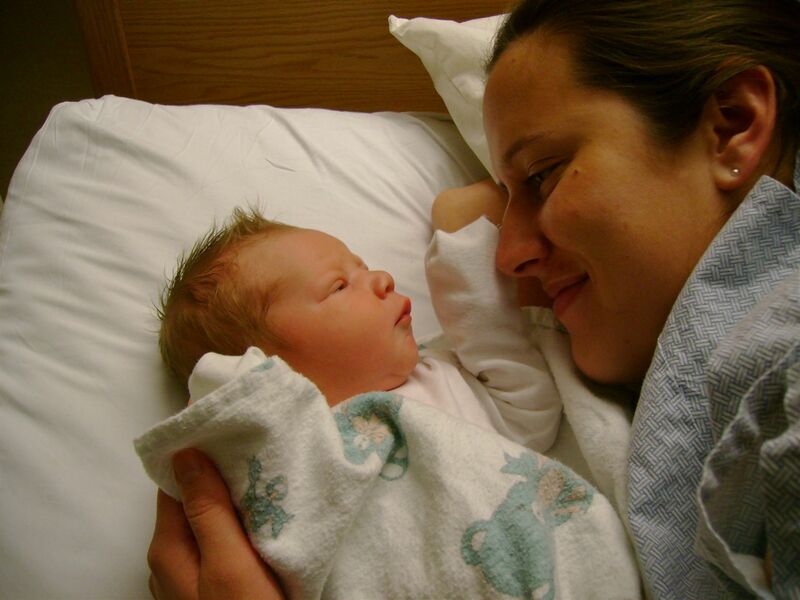 I should add for Rachel, because she is too modest to say so, she is qualified not only as a mom who has been through it, but she is a nurse and has studied this topic extensively. She is definitely a source I respect for this topic. I have a napping CIO question. I have a 12 week old little boy. He has been napping in his swing during the day and sleeping in his crib at night since birth. This week I started napping him in his crib during the day. He has not been doing well sleeping in the crib during naptime. He will lay there and coo, cry some and maybe sleep a little, but not the solid naps he would get in the swing. I do a naptime routine, change diaper, read story then into the crib awake. I do the feed, wake sleep cycle. When he won't nap though it is very difficult to keep him awake during feeding, but even if I am successful at keeping him awake he still does not nap well during the next cycle. He eats every 3 hours during the day and stretches 8 hours at night. I am on day 4 of napping him in the crib…Any ideas?? Katy, you might have him up too long. There are a lot of possible things going on. See the CIO Bootcamp post. See also the optimal waketime post for ideas. There are a few possibilities. One is that he is ready for a bit more stimulation durding waketimg OR a bit longer waketime length. My dilemma is my 8 month old son is having a really hard time sleeping consistently through the night and with length of naps. My daughter who is almost 3 was a textbook Babywise for the most part, started to sleep 10 hrs at night at 6 weeks old and never looked backed except for a few times when teething or sick, but for the most part never had issues with night. Her struggle was more with 45 minute intruders for naps, but we eventually got through them and she was good napper. Now my son on the other hand I can't figure out. I nurse him, I also nursed my daughter until she was 1. I started Babywise with my daughter about 4 weeks old and my son 3 weeks old. Right when I started it with him he started a really fussy stage, not full blown colic, but pretty close and it lasted until he was about 10 weeks. I was exhausted, tired and emotionally drained because nothing worked. It was hard to sleep train him during that time because everything I tried was useless, he was still fussy and clingy. He spit up, but never reflux and he didn't fit the colic mold so it was hard to figure out what was wrong. I tried all I knew from baby wise and read so many posts and chapters on the subject but nothing every stuck. I remember shortly after his fussy stage stopped he had a really good night sleep, I think he went 10 hrs and I was excited I thought this it! We made it, he is finally sleeping through the night and then teething started early and he had a really difficult time sleeping while teething and it was hard for me to let him cry it out when I knew he was teething, he got 8 teeth in 4 months. What I also found difficult is when we finally wanted to tackle aggressively his night sleep because we knew he wasn't fussy, teething, sick, etc he was a night pooper for a good while, maybe a couple of months, that was hard because I always went back and forth in my mind if he had a poopy diaper when he woke up at night, 75% of the time he did and so that made it hard as well. Both my daughter and son didn't respond to the dream feed. But my daughter seemed to still sleep consistently through the night even without dream feed. Another thing that is different with my son is he is an early bed time guy, he is usually asleep by 7, sometimes 6:45.. He is now almost 9 months, tomorrow, and I have finally been able to really be aggressive with the sleep training because he isn't teething anymore, etc. but it is still difficult. Even through the ups and downs with him I have always put him on a schedule so he does well with feeding for the most part, going down for naps and going down at night on his own without crying, his problem is staying asleep and putting himself back to sleep, it always has been. His schedules were always thrown off because he never slept very long. Now he usually goes down at 7 and can wake up at the most random times at night, they are never consistent, never have been, some nights he will sleep 9 to 10 hrs straight and some he is all over the map, 2 to 3 times up crying and I usually end up nursing him because nothing else works. And he always has awaken early and never consistent, I can remember a handful of times he wakes up at our desired wake time which is 7am. I feel so discouraged because my first born was textbook and I felt so prepared for my second and he has just never fallen into any mold of Babywise sleep techniques and it makes for a very stressed Mama. My other concern is he is older now and I know its harder as they get older, but I want to know what to expect at this age and I can't seem to find any clear post on how to tackle a baby who has really struggled. Sorry for the long post, if you have any new insight for me I would greatly appreciate it! Thank you! Katie, the trick is to figure out why he is waking. My guess as to why he is currently waking is he is either hungry (I think it is possible with him being inconsistent with his waking) or he just can't soothe himself back to sleep and random things are waking him up enough that he wakes fully. Sorry it wouldn't let me continue writing for some reason. I would say you likely need to do sleep training. I don't have posts on sleep training older babies because I haven't done it. You can join the google group and ask for experience with older baby training in there. Alison – do you have a dog? A baby is very, very similar to a puppy. But beyond that, yes, you can "train," or guide a newborn. It takes steps, patience, and flexibility, but you can help your child know that a. they will get a full feed, b. when it's time to sleep (light v. dark room, loud v. quiet, etc), and how to self-sooth. It takes time, but you can start with that full feeding and aim for 2.5-3 hrs. right away.